I had the pleasure of a brief sit down and tasting with John Cashman, New Business Development Manager, of Cooley Distillery who was in Vancouver and Victoria marketing his range of Irish whiskey to the trade and public. 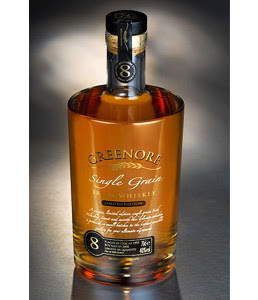 During our chat we tasted the Greennore Single Grain 8 Year, Tyrconnell Single Malt, and the Connemara Peated Single Malt. 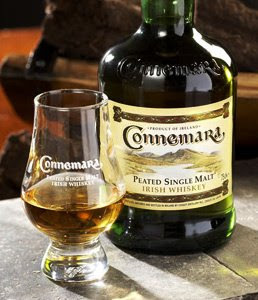 John mentioned that prior to 1987 (Cooley's founding) The Irish whiskey industry was controlled by two spirit giants: Diageo and Pernod Ricard. 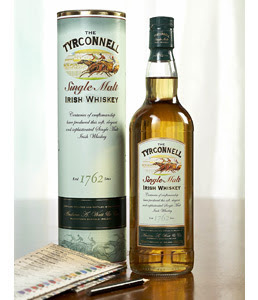 These two multi-nationals marketed Irish Whiskey to the world trade and public with the thoughts of Irish implying "no peat and triple distilled". Cooley resurrected mothballed distilleries and the original concepts of true Irish whiskey; peated and double distilled like Scotch. Cooley Distillery was named World and European Distiller of the Year in November 2008 for their spirits at the International Wine and Spirit Competition. Small batch single grain irsh whiskey matured in used bourbon casks for a minimum of 8 years. Sweet coconut, corn, and vanilla notes on the nose. Medium-bodied, lush and smooth, with vanilla, spice, and sweet oak flavours. An Irish Bourbon ? Perfect pre-dinner aperitif spirit. 5000 case production.